These days, Toyota’s motorsport efforts are focused primarily on Formula One and Le Mans-style prototypes, but that wasn’t always the case. You see, back in the ‘80s and ‘90s, Toyota played a major role in the crossed-up, dirt spraying, high-flying insanity that is the World Rally Championship, even collecting a few championship titles to its name along the way. Now, Toyota is poised to make its return to the highest echelon in rallying with a new race-ready Yaris, and by all accounts, its looking like it could be running at the front of the pack when the 2017 season gets underway. Like the rest of this year’s competitors, the juiced-up Yaris will be packing nearly 400 horsepower, a huge amount of downforce, an upgraded AWD system, and the sort of attitude you’d expect from an old veteran in the sport. Thing is, Toyota is gonna have its work cut out for it, especially when you consider that the last time a Toyota stormed a WRC stage was in 1999. That said, the 2017 regulations are looking to provide one helluva show, with some folks drawing comparisons to the legendary Group B era of the ‘80s. 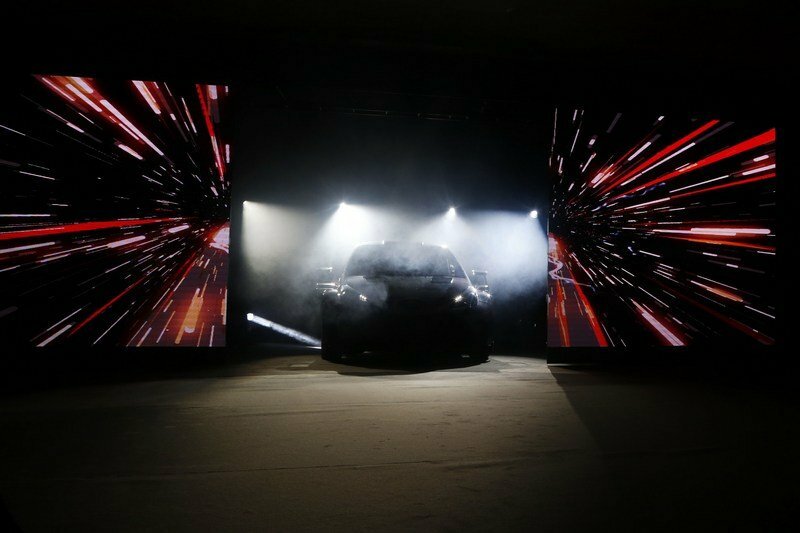 That means each of this year’s competitors will be pushing into the unknown, and conversely, Toyota’s fresh re-entry might be on slightly more even playing ground than first anticipated. What’s more, the Toyota effort will have an all-star list of talent to back it. 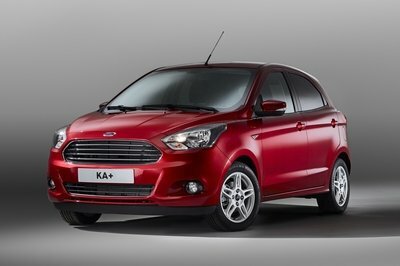 But will it be enough to keep pace with Citroen, M-Sport, or Hyundai? 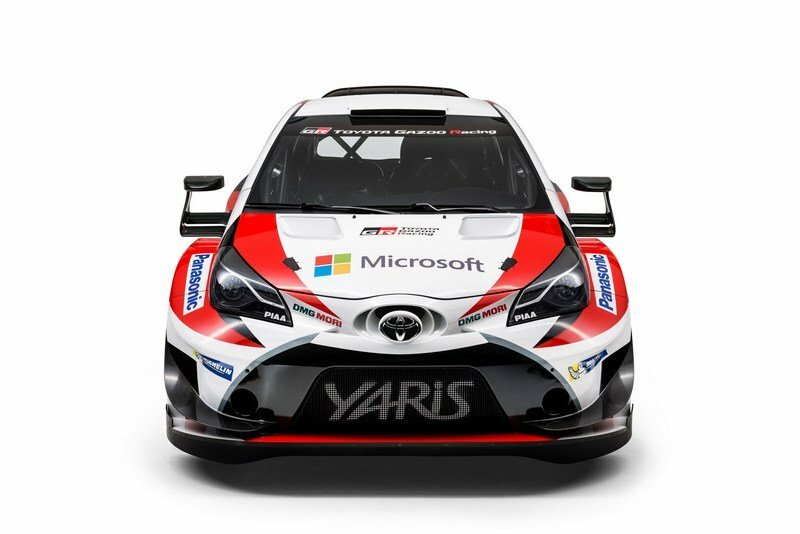 Only time will tell, but for now, read on for the details on Toyota’s plans and the new Yaris WRC competitor. 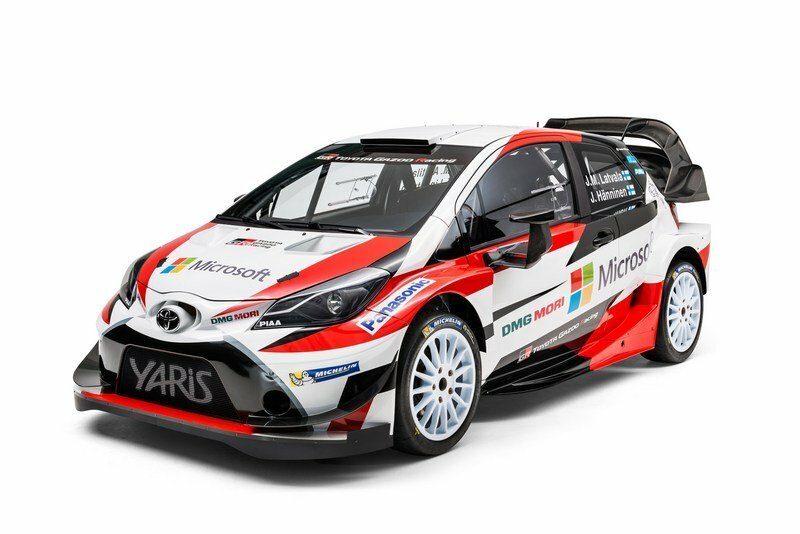 Continue reading to learn more about the Toyota Yaris WRC. 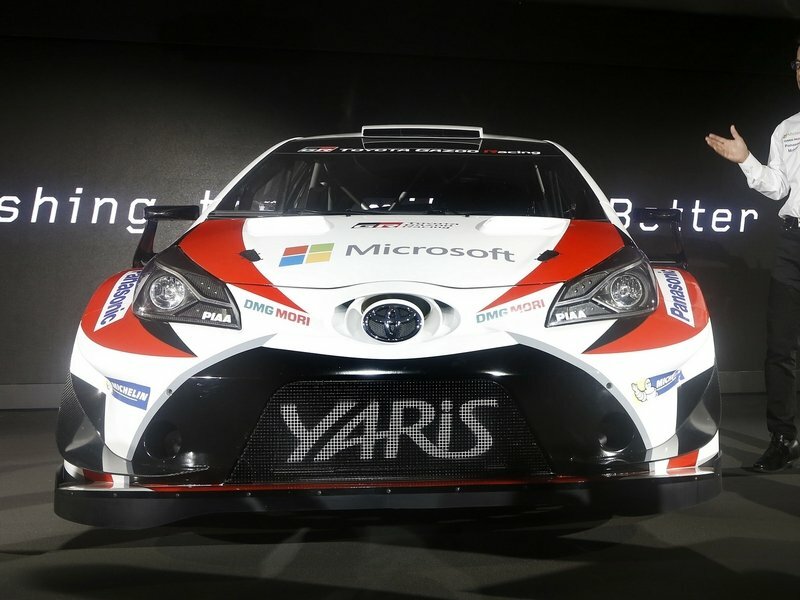 The new Toyota Yaris WRC has been in development for a little more than year now, but diehard fans of Toyota’s WRC rally cars have been patiently waiting for this renewed effort for the last 18 years. While Toyota has been doing rally events since the ‘70s, the brand first managed to step into the WRC in the ‘80s. By the ‘90s, Toyota was running at the front of the pack, eventually securing a string of championship titles thanks to the efforts of names like Carlos Sainz, Juha Kankkunen, and Didier Auriol. Toyota ended up leaving the WRC following the 1999 season, instead opting to refocus its motorsport efforts on Formula 1 and Le Mans-style prototypes. 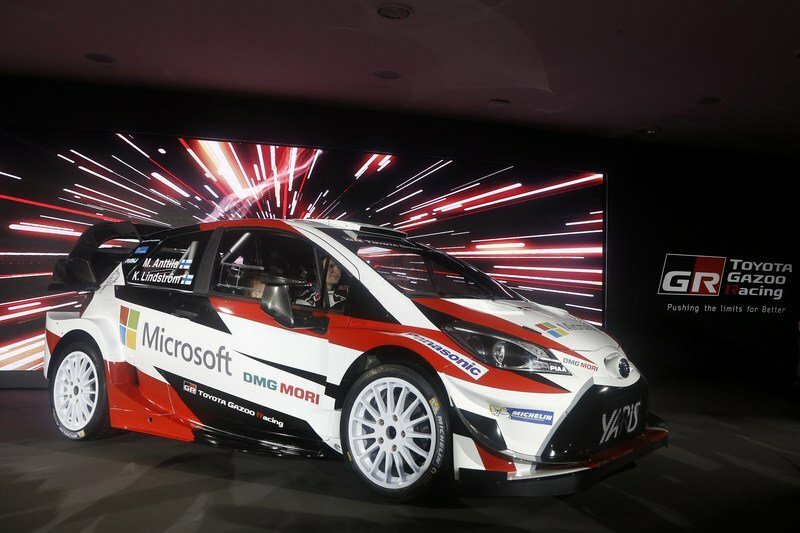 But now it’s back and looking sharper than ever with the new Yaris WRC. Design and development duties were originally handed to Toyota Motorsports GmbH, the same performance division that evolved from Toyota Team Europe in 1993. It’s also the same group that put forth Toyota’s WRC rally efforts with souped-up Celicas and Corollas in the ‘80s and ‘90s. It seems like the most natural fit, but given Toyota Motorsport GmbH’s primary focus on the TS050 Hybrid, the brand’s high-tech La Mans competitor, Toyota eventually decided to hand development and team building responsibilities to Tommi Makinen. Toyota decided to hand development and team building responsibilities to Tommi Makinen. Makinen is a name that’ll likely ring a bell if you’re a fan of rally. The 52-year-old Finn is best known for his four WRC championship titles in 1996, 1997, 1998, and 1999, with previous work experience including stints with teams from Nissan, Mitsubishi, and Subaru. Mitsubishi even named an Evo after him. Now, the retired former world champion is the Team Principle at Gazoo Racing. 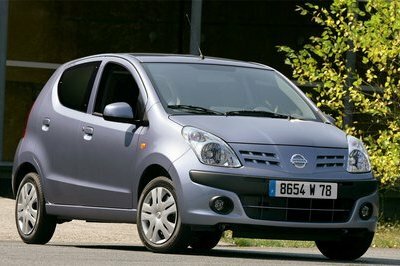 Gazoo Racing is another big name in the world of motorsport, although not from the world of rally. Known best for its efforts in endurance racing, Gazoo Racing is now stepping into rally with it’s own separate base, including a headquarters located in Rovaniemi, Finland. The new Toyota Yaris WRC first entered development in March of 2014. For the 2017 season, cars entered in the WRC will receive huge new aero, more power, lower weight, a wider stance, and a new drivetrain with a centrally controlled differential. The new regulations are designed to make the racing much faster and challenging, and should shake things up considerably when it comes to the established balance of power, all of which is leading some to dub the 2017 season a rebirth of the Group B era of rally racing. Toyota plans on throwing two cars into the fray, with three pairings of drivers and co-drivers on the roster, all six of which are Finnish. And why not – as they say, if you wanna win, hire a Finn. Aiding in development is an international team of experts, including engineers Tom Fowler, Simon Carrier, and Mikko Ruoho. Heading the roster will be Jari-Matti Latvala, the 31-year-old driver who arrives from the recently dissolved Volkswagen WRC team, bringing co-driver Miikka Anttila along for the ride. Latvala has been in the WRC since 2002, boasting a resume that includes 16 rally wins, 169 WRC starts, and 57 podiums. After spending a good deal of time chasing Sebastien Ogier, with runner-up season finishes in 2010, 2014, and 2015, Latvala is undoubtedly ready to secure that first championship win. Heading the roster will be Jari-Matti Latvala. “I started my rally career in a Toyota Corolla GT back in 2001 and my first competitive outing in a World Rally Car was behind the wheel of a Corolla WRC in 2003 in Estonia. So in many ways, it feels like I’m coming home!” Latvala says in the attached press release. Joining Latvala is 35-year-old Juho Hanninen, who will have co-driver Kaj Lindstrom riding shotgun. Hanninen first joined the WRC in 2006, but has yet to collect a WRC event win. 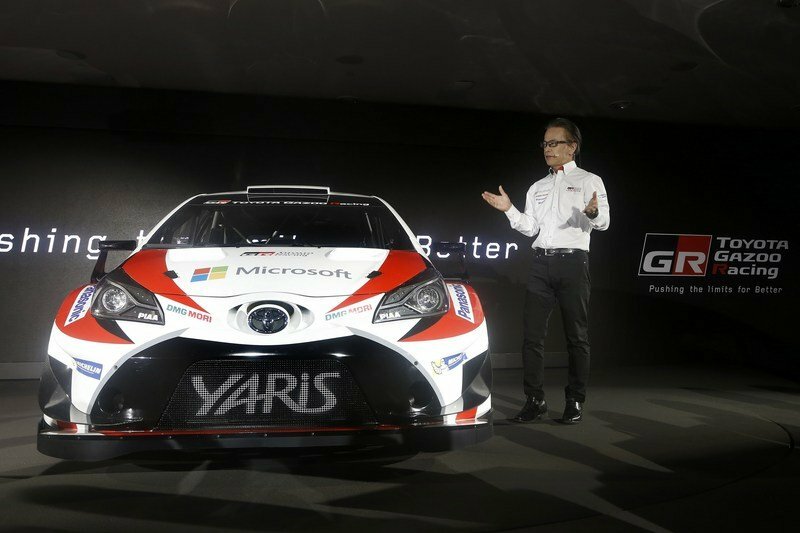 However, Toyota says his experience has been invaluable in the development of the Yaris WRC. Finally, there’s 25-year-old hot shoe Esapekka Lappi, joined by co-driver Janne Ferm. Coming on as Toyota’s test driver, Lappi snagged the WRC 2 championship last year, and should add a little youthful fire to the otherwise veteran crew. 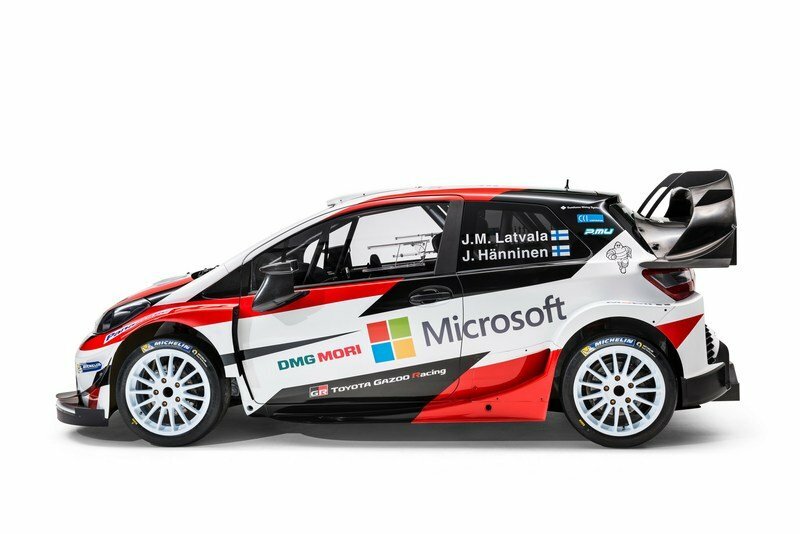 2015 Toyota Yaris WRC pictured on the left, 2017 Toyota Yaris WRC pictured on the right. While we got our first look at a Yaris WRC prototype early on in 2015 (seen above on the left), a lot has changed since then. The car currently headed to Monte Carlo (seen above on the right) looks far more aggressive and purposeful. Chalk it up to the vastly more lenient rules for aero included in the spec for the 2017 season. The whole thing is pointier, beefier, and sharper, and should fit in well on a WRC stage – or flying high above a crest. The whole thing is pointier, beefier, and sharper, and should fit in well on a WRC stage – or flying high above a crest. Let’s start in front. The first thing you’ll notice is the seemingly endless way this thing stretches from left to right. 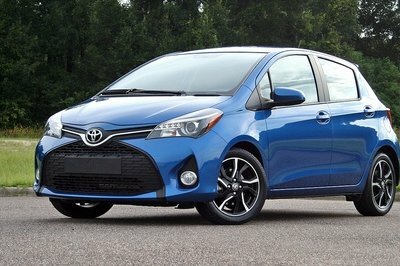 The 2017 regulations added 55 mm (2.2 inches) to the front width and 30 mm (1.2 inches) to the rear width, allowing the Yaris to be up to 1,877 mm (73.8 inches) from fender to fender. And what mighty fenders they are. It’s like someone fixed two entire tables on either side of the vehicle, giving it a boxy, flared-out appearance that simply screams “racing machine.” At the same time, the front end manages to keep a lot of the same lines found on the production car, with a broad, angry-looking grille, pointed headlight housings finished in black, and a down-turned snout. Air intakes are located in the bumper corners near hugely extended carbon fiber canards, while the front splitter extends far from the grille, partly in thanks to new regulations that extend the front bumper overhang by 60 mm (2.36 inches). On top of the hood are two vents to help evacuate hot air away from the engine. Moving to the side, we begin to see just how much width those flared fenders add. 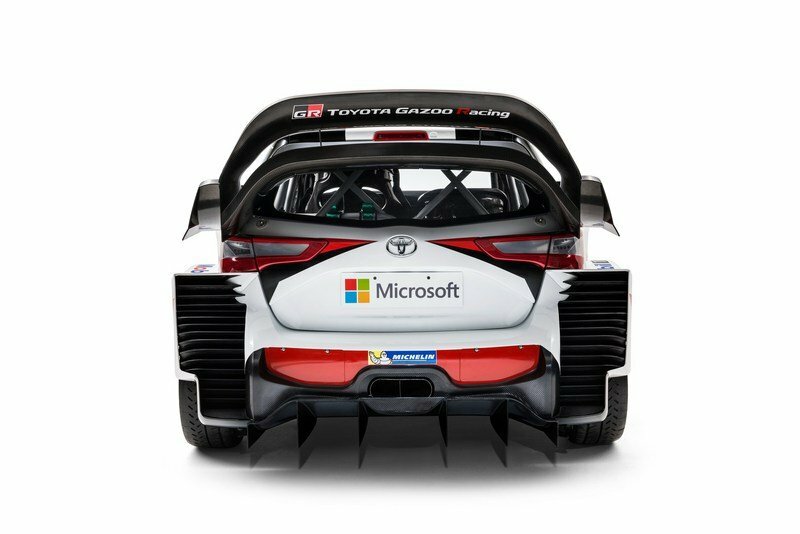 Toyota also mentions that the Yaris WRC is equipped with an adjustable track width, which should help monumentally when it comes to finding the right set up for an event. All of it is clearly well polished in terms of downforce generation – even the side view mirrors look like they are shaped to provide a little extra stick at speed. Aesthetically, the lines and livery connote a sense of forward rake, which is enhanced by the huge side skirts jutting out near the bottom of the car, seemingly rising as they move rearwards to meet the rear fender flares. Up top is a thin roof scoop to pump cool air into the cabin. All of it is clearly well polished in terms of downforce generation – even the side view mirrors look like they are shaped to provide a little extra stick at speed. Once we get to the rear of the car, the true gravity of this thing’s aero influence becomes clear, particularly with that mammoth rear wing. The unit consists of two pieces – a flatter lower section and a curved upper section, with a pair of center supports connecting in the middle. The whole thing spreads out from the rear hatch with an oversized, bigger-is-better attitude that’s very much in line with the new 2017 WRC regulations. More aero goodness is found below the wing, where the fenders terminate in descending rows of vents and slats. Hugging the rear bumper is an equally large diffuser, just above which is a single, oval-shaped central exhaust. Note: Audi Quattro S1 from the Group B era pictured on the left, Yaris WRC pictured on the right. 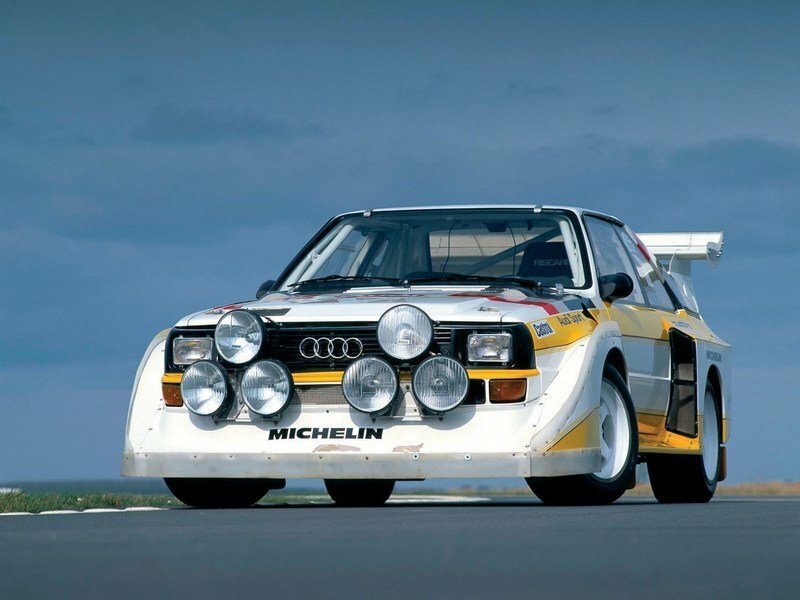 Looking this thing over in detail, it’s not all that difficult to see some of the similarities to the Group B era, especially with the boxy fender flares and outrageous rear wing. Toyota neglected to provide us with any pictures or specs on what it was putting into the cabin of its new rally racer, but it shouldn’t be all that difficult to speculate. For starters, there will definitely be a full roll cage, per the FIA’s regulations, plus a carbon fiber dash set with full digital instrumentation to provide the driver and co-driver with all of that important info. Fixed-back racing buckets and racing harnesses keep the passengers in place while executing high-speed powerslides, and an intercom system keeps the pace notes flowing without interruption. The Lexan windows get small sliding doors to exchange time cards, while a fire suppression system rounds it out with some just-in-case safety. Like the rest of the 2017 WRC lineup, the Yaris WRC is equipped with a 16-valve, 1.6-liter direct injection inline four-cylinder engine. Bore measures in at 83.8 mm, while stroke is 72.5 mm. With the turbo spinning at full blast, peak output is rated at around 380 horsepower, while torque tops out at 315 pound-feet. These figures are a substantial uptick compared to last year’s batch of cars, which were outfitted with roughly 300 horsepower and 295 pound-feet of torque. Part of the increase is thanks to the larger intake restrictor used for 2017, which sees a size bump of 3 mm (0.12 inches), from 33 mm (1.3 inches) to 36 mm (1.4 inches). 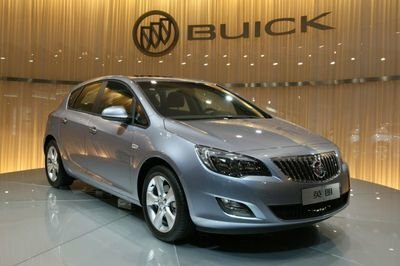 Routing the 1.6-liter’s prodigious output is a six-speed hydraulic gearbox, which feeds a high-performance AWD system to apply max power to whatever surface happens to be underneath. 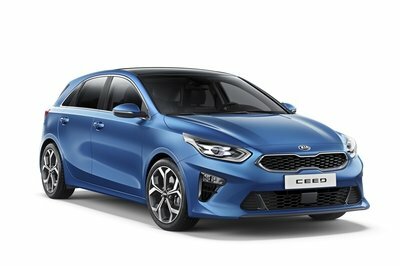 Of course, the new engine specs are also a substantial increase compared to the production Yaris, which, in case you forgot, gets a 1.5-liter four-cylinder packing 106 horsepower and 103 pound-feet of torque. Back to the WRC variant. Routing the 1.6-liter’s prodigious output is a six-speed hydraulic gearbox, which feeds a high-performance AWD system to apply max power to whatever surface happens to be underneath. The drivetrain specs were also updated in the 2017 regulations, and now allow for the use of an active center differential to offer better “torque split options” when hunting for grip. Meanwhile, the front and rear differentials remain mechanical units as before. Clamping it all down is a double-plate sintered clutch. The drivetrain specs allow for an active center differential. Toyota won’t divulge the car’s final acceleration numbers, but will say top speed is rated at 201 kph (125 mph). A much higher top speed is definitely possible given the amount of power this thing is packing, but the gearbox places a limit on the maximum velocity figure in favor of greater acceleration. And besides – when you’re flying between trees on a gravel road, 125 mph is pretty darn fast. To help keep this thing shiny side up, the Yaris employs a MacPherson strut suspension in front and in back. Toyota says that the amount of suspension travel is “classified,” but we do expect it to be ample. Helping it turn is a hydraulic rack and pinion set up for the steering. Making it stop are four-wheel disc brakes, with both air and liquid cooling systems to keep the fade away. Disc diameters vary depending on the event, given the differences in wheel and tire sizing. When attacking a gravel stage, the Yaris WRC will use 300 mm (11.8 inch) discs, while a tarmac stage will see 370 mm (14.6 inch) discs. Toyota says the Yaris is capped at a minimum weight of 1,190 kg (2,624 pounds), which is actually a little heavier than competitors like the Citroen C3 WRC (1,175 kg, or 2,590 pounds). These figures are both lighter than the outgoing weight spec, which was capped at 1,200 kg (2,646 pounds). Making it stick are Michelin tires. “Both people and cars are trained and strengthened when they are exposed to conditions that exceed the imagination during competition,” says Team Chairman Akio Toyoda in the attached press release. It’s looking like Toyota will use this experience to offer up a Yaris Gazoo road car. For us fans, it means another top-level competitor to spice up the action. 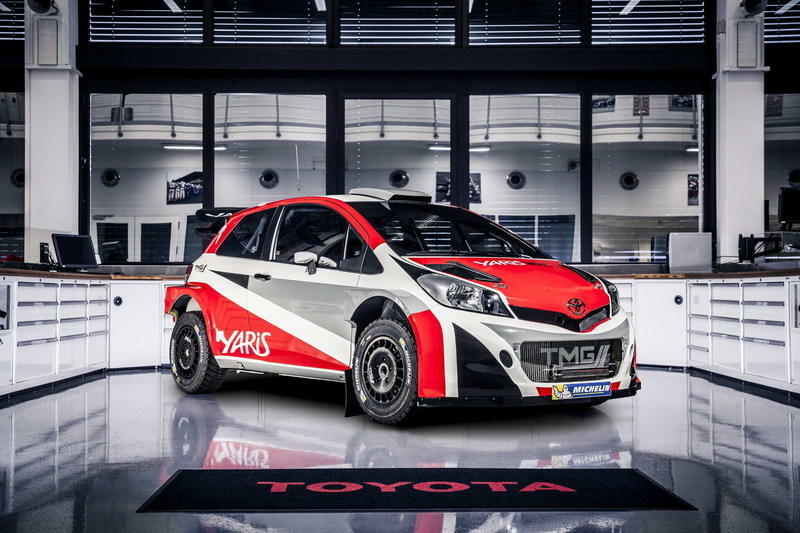 What’s more, it’s looking like Toyota will use this experience to offer up a Yaris Gazoo road car, taking cues from its experience in the WRC to put another high-performance hatchback on the road. And I think that’s something we can all appreciate. 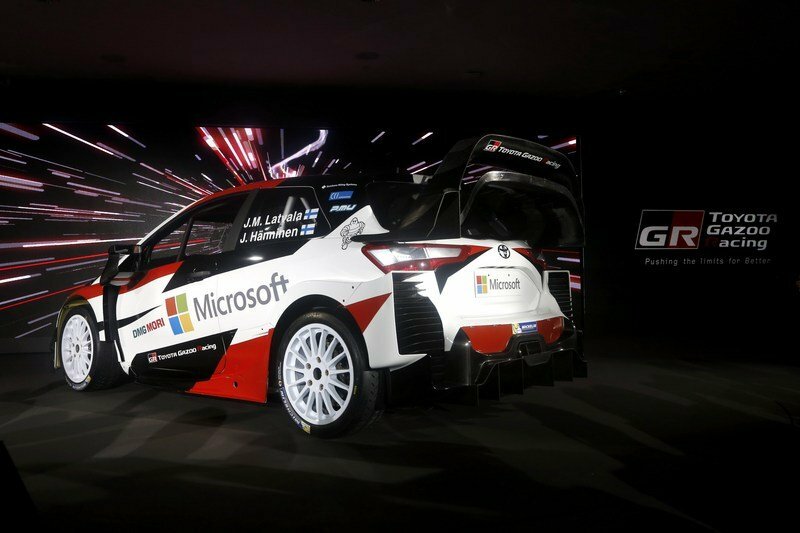 But we’ll have to see if Toyota, the new Yaris WRC, and Latvala have what it takes to lead this season. Either way, expect a whole lot of excitement. The return of Toyota to the WRC!